The plan of course, will eliminate much of the alleged cultural material from the high school and college courses these students take, but it will relate the work in science, mathematics, etc., much more intimately to the actual life interests of these students. Things will not be studied for the recitation, for the examination, or for the credits, but for their use in the practical affairs in which the student is engaged. Today I will be selling my work at the Fall Art Fair in Eureka Springs. So if you want to spend a black Saturday shopping for holiday gifts instead of making beautiful and useful things yourself, come on down. The time has come for schools whose aim shall be to serve the needs of modern industrial democracy, that shall build upon the fine instinct for workmanship that is the very life of industry when not permeated by caste;—schools that shall declare: ”The ideal university is a place where nothing useless is taught.” It belongs to an aristocracy to support the useless—useless garments, ceremonies, athletics, learning and whatnot—as the sign of an ability to indulge itself in reputable expenditure. A democracy justifies its existence on the ground of its usefulness, its ability to create and do, and its faculty to enjoy creating and doing. The new school will start with the constructive energies; it will unite the senses and the soul; it will employ the hand equally with the brain; it will exalt the active over the passive life; it will love knowledge of its service; it will make a real and not a false use of books; it will test production not alone by its pecuniary results but by human values—whether it yields pleasure or pain. The problem of democratic education is not to give the people a culture alien to their lives but to transform that which they have into something more rational and harmonious. Under present conditions of specialization, the master is separated from the man, the designer from his tool. These conditions require that the tool be sharpened for the designer, that the man be disciplined for the master. However advantageous this relationship may be economically, it has little value educationally. It destroys the totality of work and the integrity of life. It sinks the individual into the product. It permits no one in the whole series of specialized activities to be, in the full sense of the term, a creator. It tends to develop experts, but not full rounded men. It is almost totally defective in idealism. The theory of the new industrialism is that in industry the whole of life can be contained. The true workman loves his craft for its life quality, because the thing upon which he works is somehow a part of his own inner ideal. The changing order that Triggs hoped for over 100 years ago never came in full measure. But it is never too late for such things. it requires the sustained exercise of craftsmanship. In keeping with the title of this post, An article about Bill Coperthwaite was published online. My wife and daughter and I are headed back to Arkansas following Lucy's successful defense of thesis and our wonderful Thanksgiving feast with my cousin Mary Lou and her husband Michael in Waukesha. We are facing a long drive in the morning so I can set up on Saturday morning for the Fall Art Fair, where I hope to sell some of my work. I'll be at the Inn of the Ozarks in Eureka Springs on Saturday and Sunday. In the meantime, folks are camping out in front of department stores to score big deals, and would all be so much better off if they were camped in their basements with tools to make beautiful and useful things. But then that would take skill, imagination like most folks have no more, and a sense of their own creative power. Since we are starting with a late Thanksgiving, folks only have 26 more making days before Christmas. And we would be a far more moral nation if we were each busily engaged in crafting useful beauty to give to each other invested with a craftsman's concerns. 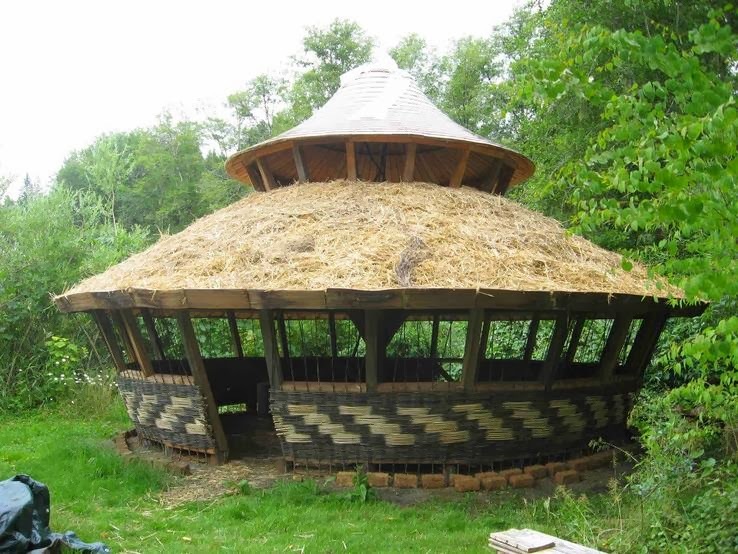 The yurt in the photo above with woven sides is one of Bill Coperthwaite's creations built in Oregon in 2009. Bill was intoxicated with the joy of teaching others to make things. And if you can understand that at all, you will know that Bill will be missed. Peter Follansbee has a tribute post to Bill Here. I wish all my readers the happiest of Thanksgivings. Many folks will be starting their holiday shopping this morning. But many more will be baking delicious pies, and mashing potatoes and waiting as the turkey is be baked to perfection. If you're worried about yours, Butterball has a hotline, 1-800-Butterball (800-288-8372). Thanksgiving is one of the most hands-on of American holidays, and my favorite. The first consideration must be to give play to the deep-lying motor instincts and demands of the child; to enable him to become conscious of his powers through the variety of uses to which he can put them; and thus to become aware of their social values. To give play, to give expression to his motor instincts, and to do this in such a way that the child shall be brought to know the larger aims and processes of living, is the problem. The saw, the hammer, and plane, the wood and clay, the needle and cloth and the processes by which these are manipulated, are not ends in themselves; they are rather agencies through which the child may be initiated into the typical problems which require human effort, into the laws of human production and achievement, and into the methods by which man gains control of nature (and his or her own nature) and makes good in life his ideals. Out of this larger human significance must grow gradually the interest in the technical problems and process of manual training. When the interest becomes of the purely technical sort, then of necessity manual training no longer occupies a central position; it belongs upon the level where all other forms of special technique are found. When manual training is so interpreted, there is a necessary correlation between it and history and science. Just as man came originally to know nature in its variety of forms and forces through the active dealings which he had with it, through his attempts to modify it to meet his needs, so the child who in orderly fashion directs his motor powers to recapitulate social industries comes to know typical materials and the typical causal forces upon which the outward fats depend... Correlation of manual training with science is likely to be a rather external and artificial matter where the manual training itself is conducted for technical ends—for ends, which lie within itself. But when it is treated as a means of organizing the powers of the child in social directions, its scope is necessarily broadened to take in salient facts of geography, physics, chemistry, botany, mathematics, etc. When Dewey was writing these words, manual arts in school had become normal and widely accepted. Now even to have any kind of art at all has become rare. In some states, even though the arts are required for all, one art teacher will be responsible for several schools, only briefly touching the lives of their kids. If we've become a nation of idiots, we can look at what's happening in the arts and the near complete loss of manual training in schools and see why. The text within the parentheses in the quote above is mine. I learned that from Peter Follansbee that my friend Bill Coperthwaite, age 83 passed away on Tuesday in a car accident on icy roads in Maine. Readers may remember my visit with Bill during the summer of 2011, described in part in this blog post, Grit. Bill is a man I will miss, and one who contributed greatly to my own understanding and appreciation of the human hand. You can learn more about my own visits with this remarkable man by using the search function at upper left. Type in "Coperthwaite." It seems that once kids get to high school age, parents and administrators panic and begin thinking of career and technical education if their kids aren't college bound. But educators have traditionally overlooked the value of manual arts training for the younger child. The following is from Colonel Francis W. Parker, President of Chicago Institute, 1901. "In 1883 we started manual training in the basement of Cook County Normal with rude benches, poor tools, and a fair teacher. So far as I know it was the first manual-training school in connection with a normal school. The sloyd had not come to these shores, the kindergarten had been started 14 years, psychology had not appeared, nor child-study. I had a faith that the activities of the child were not duly recognized; that he was intensely active and that he had not enough to work off and develop his energy in the right direction. What to do I did not know, but to so something, I did know. "They told us—we got it dogmatically—that the little children would have no chance; manual training had begun in the high school. These things always begin wrong end to, and one who reads the history of education can bring that out. We took the little six-year-olders in and gave them woodwork—planes and saws—and it was perfectly plain and we saw at once that the children were getting their birthright. They were dying to do something and we found it out. Blindness to all this consists in excursions and results outside the child. When you look at the child you find what we mean. We have been trying to get at that and we have just begun. I will not go into the details of that, only I never saw a child who did not love manual training and boys and girls love it alike. I would have the boys learn to cook and to sew if that is educative. "What work shall they do? Our friend Salomon says logical sequence is an error, and yet the sloyd is founded upon it. The sloyd has done an immense amount of good; I do not know what we should have done without it; but the fundamental element, logical sequence, is a fundamental error in all education. It leaves out the child entirely and says he must go through his work perfunctorily. "In the first place we have learned that the child is full of activity. He wants to put his thought into the concrete—every child, rich or poor. It has been a delight to watch the children who have been unfortunately rich and neglected, who come into the shops. When they find they are to do something themselves, delight seizes their souls; they are full of activity. 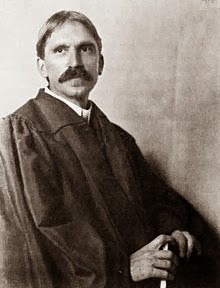 "Dr. John Dewey, the great philosopher of the new education, when I asked him years ago, ‘What would you have a school?’ Replied: ‘Industrial’. I agree." And it seems now with core standards and the like, we are once again looking at superimposed models rather than toward the needs of each child. I, on the other hand, wonder what it would take to help educators in all disciplines, including academic subjects, realize that they might learn something… at least a thing or two from manual arts training. Does that seem like a complete impossibility? Then add to that, the chance that they might learn something from manual training (Sloyd) from the 19th century? That might be a stretch for even the most open-minded educators. It seems we are too educationally inept and over-charged with institutional egotism for that realization to sink in. Some readers may remember that my own program started as one for high school aged kids, and it was under the guidance of Educational Sloyd that we began to address the active woodworking/learning needs of the younger set. R. Charles Bates, in 1901 was asked to share some observations from the 5 years in which he had been director of the New York State Reformatory at Elmira. "Manual training is not only of value as an educational factor leading to self-activity and mental development, but it becomes in the hands of the scientist, one conversant with pedagogy, psychology, and applied mechanics, a potent factor for moral ends. It opens up avenues for activities which are in direct consonance with the laws governing moral expressions. All morality is but a harmonious adjustment of one's higher self, or nature, with known elements in human character, which elements are the vital forces in society that lift it above license, above conspiracy, above abuse. It is that force in human affairs which removes the disposition to riotousness, to self-abasement, and puts one in an atmosphere of conscious relation to divine law. It is clear to my mind that the presence of manual training in our public-school system will have a far-reaching influence upon human activities because it gives the delightful balance in mental growth which indicates the wisely educated person. For defectives in public institutions it is possible through manual training to awaken dormant consciousness of creative force, and further, it brings into use the neglected motor areas of the brain through the enforced functioning of their corresponding muscular agents. I cannot close this paper without reference to that pertinent remark of Ruskin made long before the science of teaching was as well understood as at present. It is as follows: 'A boy cannot learn to make a straight shaving or drive a fine curve without learning a multitude of other matters which the life of man could not teach him.'" Mr. Bates seems to have quoted Ruskin in a way I don't recognize, but he got the rest of it right. When we deprive children and adults of their creative power, leave their hands untrained in moral expression, we get the society we would not like. Putting skill in the hands of kids can be effectively used as a measure for awawakening moral force. That moral force can be simply described as "craftsmanship." TV actor and dirty jobs activist Mike Row is attempting to renew an interest in skill. The idea among some is to get away from it. Let the machines do it all. And of course a designer of 3D printers and a programmer who can create designs may have skill, that can be applied through technology so that no one else will ever need it. But is that the way we build a successful and meaningful society? If craftsmanship is the most direct means of building moral fiber, is a world of 3D printing what we want, or can craftsmanship using simple tools, saws, hammers and the like, and real materials like wood, do a better job of preparing children for the challenges of moral engagement in a real world? Just asking. It would be a dumb-assed question for those who only see the new, and do not see any values in the past or in human culture before the invention of the 3D printer. My daughter Lucy successfully defended her thesis yesterday and will be awarded her Masters degree in environmental science at the University of Wisconsin. In the news this morning in Madison is that they've proven the existence of the Emerald Ash Borer in city trees. 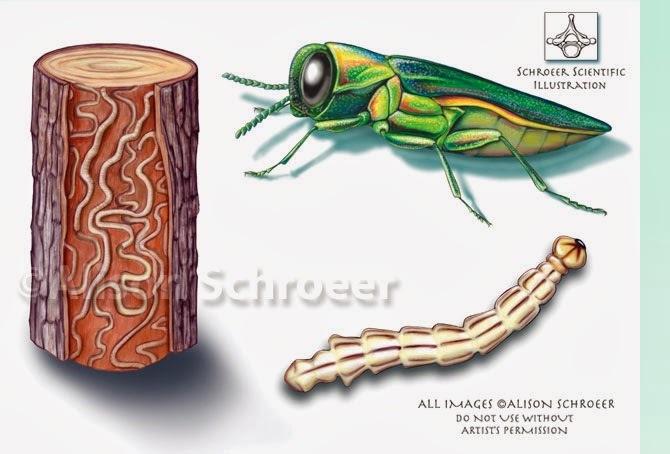 This beetle threatens over 21,700 ash trees in the city of Madison, nearly 25% of its street trees. Healthy trees will be treated with insecticide and unhealthy trees will be removed. It is a sad day for lovely trees and the citizens who love them. Play with blocks, (before the computer age in which toddlers and young children play with iPhones instead) became a thing familiar in the lives of many children as a result of the tools used to stimulate learning in Kindergarten. 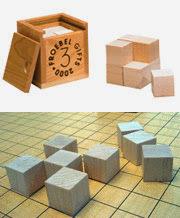 Froebel's 3rd, 4th, 5th, and 6th gifts were sets of blocks that came in small cubic boxes with sliding tops, that allowed them to be strategically and systematically introduced (and subsequently be put safely away) and thus control the child's initial engagement and consequent "self-activity" in their use. Remember that Educational Sloyd was first introduced to extend the Kindergarten method into the upper grades and assure the child's actual interest in learning, and the sad thing is that many early advocates of manual arts training never realized that important connection. Manual arts training became a system for preparing kids for employment when it was indeed a means through which children could be prepared for life… even for those children who would be going on to higher education. The thread of purposeful play that runs through effective learning should never be ignored. The following is from Grace Fulmer's book, "The Use of the Kindergarten Gifts:"
The third gift is a wooden cube divided into eight equal cubes. Every young child instinctively puts things together and takes them apart, not for the sake of accomplishing any definite thing, not at first because he wants to see what he can do with them, but just because he has a certain instinctive curiosity which impels him to handle every thing that comes within his reach. It is at this stage of his development that we see him on the nursery floor, opening and shutting a box over and over again, taking a cork out of a bottle and putting it back or attempting to do so numberless times, taking from tables and shelves every available piece of bric-a-brac, pulling things out of drawers and stuffing them back or leaving them on the floor and numerous other acts of the same kind. Froebel would lead the child from mere handling--the simple activity of taking apart and putting together--to productive or creative self-activity. In other words he proposed to take account of the development from mere instinctive curiosity to genuine intellectual interest, and his kindergarten materials were designed with this purpose in view. 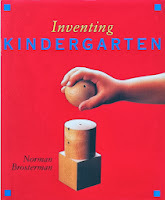 What was proposed by Froebel was not your ordinary play with blocks, and all teachers should become aware of what was done with those blocks. Froebel was a genius and from the gradual introduction of blocks in sets of growing complexity, lessons were offered that connected the child with community life, with knowledge and mathematics, and with the ability to discover beauty. These exercises were called "forms of life, forms of knowledge and forms of beauty. You can learn about Froebel's use of these blocks in the Milton Bradley publication, "The Paradise of Childhood, Quarter Century Edition," free from Google Books. The gridded surface shown in the image above was one of the features of early Kindergartens. Work tables had grid patterns laid out on the surface for blocks to be arranged in symmetrical patterns expressing beauty and natural order. The additional sets of blocks, 4, 5, and 6 each added to the complexity and potentiality for expressing form, knowledge and beauty. Through preparation in Kindergarten, when kids finally reached woodworking age, they were prepared to do amazing things. And would do amazing things in life. These days, kindergartens are nearly all directed toward reading and verbal skills for which the children see no use. 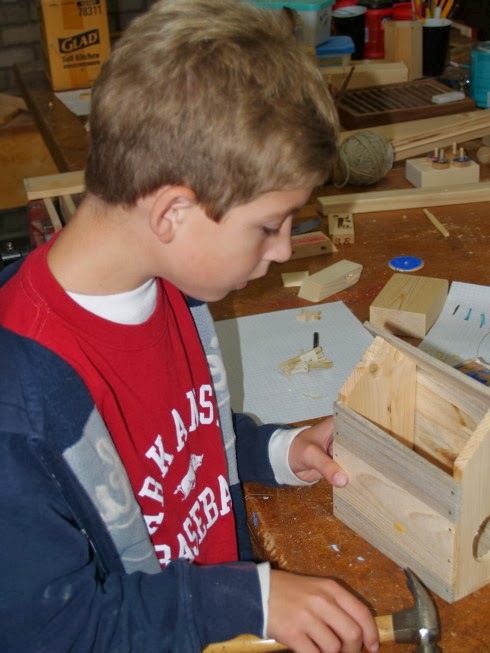 And these days, few schools have woodworking activities to engage the creative imaginations of kids. Today I am in Madison, Wisconsin for my daughter's "defense of thesis" on depletion of groundwater related to high volume wells used for irrigation. Trout streams and lakes are currently threatened by groundwater depletion. I have a small problem on my Mac Air that I use when I travel to keep up with things including this blog. Every once in a while the screen will suddenly go black for no apparent reason, and while it doesn't result in any loss of data, I'm left poking keys to try to get it back to a state of wakefulness. That may not be a problem if I'm just responding to emails, but is a larger problem if I'm making a power point presentation and am suddenly left black screen for no apparent reason. This morning I decided to see if I could learn why, and to see if any fix was proposed for this recurrent problem. It seems that a number of folks have learned how to make it do this thing and have demonstrated it at their local Apple stores, but the folks at the genius bars are not as smart as Apple would have us think. Is that not always the case? I'm not complaining, but simply pointing out that there is a distinct difference between being able to run through a checklist, and the capacity to really understand what goes on within a complex mechanical/electronic/software system. Those who have faced this black out problem have called it the black screen of death, but as of today's date, no one has actually died from it. In one sentence, Froebel, father of the kindergarten, expressed the essence of early-childhood education. Children are not born knowing the difference between red and green, sweet and sour, rough and smooth, cold and hot, or any number of physical sensations. The natural world is the infant’s and young child’s first curriculum, and it can only be learned by direct interaction with things. There is no way a young child can learn the difference between sweet and sour, rough and smooth, hot and cold without tasting, touching, or feeling something. Learning about the world of things, and their various properties, is a time-consuming and intense process that cannot be hurried. We make the assumption that once kids reach a certain age, the necessity of tactile engagement is no longer a factor in their learning. And yet, all of my students of all ages demonstrate the foolishness of that notion. Certainly from the standpoint of being able to measure short-term learning gains in the short-term memory of kids, a quick in and out of presented data, that lasts no longer than is required to provide statistical evidence of learning makes sense. It provides the short-term sense of effective learning. But when the senses are fully engaged, what is learned makes greater sense to the child and has greater lasting effect. Hence, that which is learned hands-on by the doing of very real things in service to useful beauty and community makes greater sense, and in comparison anything less makes little sense at all. On Wednesday as the Historic Arkansas video crew was visiting in the CSS wood shop, two of my students were standing side by side at lathes, each sanding smooth the objects they had turned. They took turns testing to see whose work was smoother. "Check this," Ozric exclaimed. And when a student has done something real, he won't need an adult to reaffirm what he has noticed for himself. In the meantime, teens in some cities are playing a new game in which they walk up to a stranger and hit him or her as hard as they can in the face. The object is to hit hard enough so that the person is knocked unconscious. In some cases the game has led to the deaths of innocent persons. The following is from CNN. Youth violence expert Chuck Williams blamed the media and parents for what called extreme aggression by America's youth. Negative attention, he said, is often rewarded. "That's America. America loves violence and so do our kids," Williams said. "We market violence to our children and we wonder why they're violent. It's because we are." Williams, a professor of psychology and education at Drexel University in Philadelphia, said some young people are desperate for attention. He called it the "Miley Cyrus effect," where teens will do anything to get noticed, no matter how heinous or unconscionable. "These kids know the consequences," he said. "They want to get arrested. They want to get caught, because they want that notoriety. They know they won't go away forever because they're kids. It's a win-win all around for them." On the other hand, when children are empowered to do real creative things, as they do in wood shop, they seldom resort to violent acts in search of self. And when I talk about learning thorough play, hitting someone in the face is not what I have in mind. Some readers may find use for this analysis of various views of early childhood development: Much too early. I am in Madison Wisconsin for Thanksgiving and to attend my daughter's presentation associated with her defense of her master's thesis on groundwater depletion. I spent the day yesterday talking with the film crew from Historic Arkansas Museum, Gabe, Jennifer and Jennifer, about the hands, and how they make us smart, and in a 15 minute presentation, edited down from hours of camera time, the message comes down to a few words. Use the hands, or lose the contribution they would have made to your full human capacity and intellect. As I explained, the concept "wisdom of the Hands" may seem pretentious, but I'm not talking about my wisdom, but rather your own. For me, so much falls back on my friend having told me that my brains are in my hands and that is the same message I share with others. Our hands are our most precious resources and we neglect their use at the peril of our civilization. This a damned simple message, and yet, how many times these days are interesting and wonderful things simply thrown away, when they might instead become objects of hands-on educational contemplation? If you can't be convinced to give your child saws and hammers, at the very least you might consider pliers and a set of screwdrivers. No piece of junk should ever go to landfills without being first explored fully and taken apart by the hands of kids. The asininity of the American public is that we allow our children to become consumers rather than be makers, fixers and creatively engaged. Yesterday in the filming we started on the right track. Gabe had a slider that was supposed to allow the camera to track from left to right and back, changing its view in smooth transition. The arm that locked the camera in position was failing to lock, leaving the whole thing limp. The locking mechanism would make a clicking noise but fail to lock down. Without that arm being locked firmly in position, the slider could not be used. I suggested we take the thing apart to see why it didn't work. We did. It was a complex operation and all hands were involved, each holding something. And as a team, we managed to put it back together. In the process of learning how it was supposed to work, we were able to adjust it to work just as intended. The slider was used throughout the day's filming to help control one of the two cameras, but the greater thing was that we shared a moment early in the process in which we each found greater connection with the confidence that comes from fixing a thing that had not worked. There are neurohormones at work when we achieve something that surprises us by shifting our perspective from consumer to maker. Just as the simple slider can carry the camera left to right, from one perspective to another, the act of making something or fixing something leaves the world transformed, in that we are ourselves transformed. While the slider we fixed goes back and forth, makers and fixers move only forward. Today, I will be with a video production crew from the Historic Arkansas Museum and the Department of Arkansas Heritage, making a short video on my work. We started yesterday in the Clear Spring School wood shop, and I could not be any more proud of my students. They went right to work and were completely engaged during the time the cameras were documenting the action. Today the video will focus more on my own shop and my own work as a craftsman. There are a number of things that I hope to share. One is that we learn best when we have a use for what we learn. An example of that is that in he early days a woodsman standing at a distance could recognize all the various trees and their best use because he knew that best use. Eric Sloane had said that a common man, standing at a distance could tell the species of tree being cut by the sound of the axe. And that is a second point in education. We learn best from what we've actually experienced. In fact, a common man standing at a distance would also know the proficiency of the other woodsman, know whether or not the axe was sharp, and how close the tree was to coming down, by simply listening to the distant woodsman. It is important that museums document craftsmen's work. Which brings up a couple more points. One is simply, that what we don't use we lose, and secondly, the understanding one gets from visiting museums will not be sustained if we've failed to engage children in actually making real things. A sample of their video production work is shown below. July 7-11, 2014 at the Eureka Springs School of the Arts (ESSA). Following the principles of Educational Sloyd from the 19th century, students will develop hand-tool woodworking skills as they move from the known to the unknown, the easy to more difficult, and from simple to complex. A series of small projects and exercises, presented in the right order for the student’s growth will culminate in the making of a simple bench to express lasting skill in the use of tools and greater sensitivity to the material, wood. This class will also serve as a primer for those interested in knowing how we learn best and how hands-on learning can return to American education. This new class will be on the ESSA calendar for 2014. Registration will begin soon. Today in the CSS wood shop, I'll have a video crew visiting to document woodworking activities in my middle school class as part of a short documentary on my work. The Arkansas Department of Heritage in association with the Historic Arkansas Museum is making short documentaries on each of the recipients of the Arkansas Living Treasure designation. I was named an ALT in 2009. Still, when people hear of my award they ask, "You're a what???" I explain that being a living treasure is better than being a buried one. In any case, I am glad to live in a state that attempts to recognize the value of craftsmanship. Among all states, only New Jersey, Arkansas and North Carolina attempt to recognize living treasures in crafts and art, and it is a program that should be expanded to other states. The following video shows the use of Froebel's gift number 2. Back in 1977, there had been some local talk about Eureka Springs needing an art guild, and in response to that, I made a few calls, and dropped in on a few artists I knew, and called for a meeting of artists and craftsmen at Lake Leatherwood. About 30 artists and craftspersons showed up, and in addition to a severe case of chiggers acquired by sitting lakeside, I was elected president because I was the only one who came with a notebook to record attendance and make a list of possible members. Over the next few weeks, the organization grew to about 40 committed members, and the scope of work of that small organization grew. Among the projects it took on was an art and craft show that became an annual event. The Eureka Springs Guild of Artists and Craftspeople survived in our small local community until the late 1990's when it was disbanded so that we might turn our attention to the establishment of the Eureka Springs School of the Arts. I'm not sure the reason for telling all that except from day one, in my participation in arts and crafts organizations there have been perceptions and mis-perceptions about the relationship between craft and art. What is one, and what is the other? Are there differences between the two? And does it matter? My personal inclinations are toward the beautiful and useful well-crafted object. It kills two birds with one stone, serving both as object of contemplation, and also of service (which is also a matter for contemplation). In order for an object to be useful, it it must actually work, and it must also have integrity that lasts over time, and for those reasons both skill and understanding are required. And for those reasons, I hold craft as the generally higher form of artistic expression. I guess I'm backward from most in that. In the Albany airport, second floor Concourse B, I found a large wooden sphere with iron rings, called Lubber, Red cedar, steel rings, 1994 by Dean Snyder. 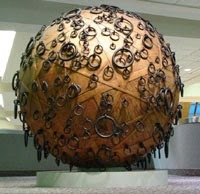 "Lubber, a sphere of laminated cedar veneer punctuated with hand-wrought iron rings, sits as a sentinel to the concourse. 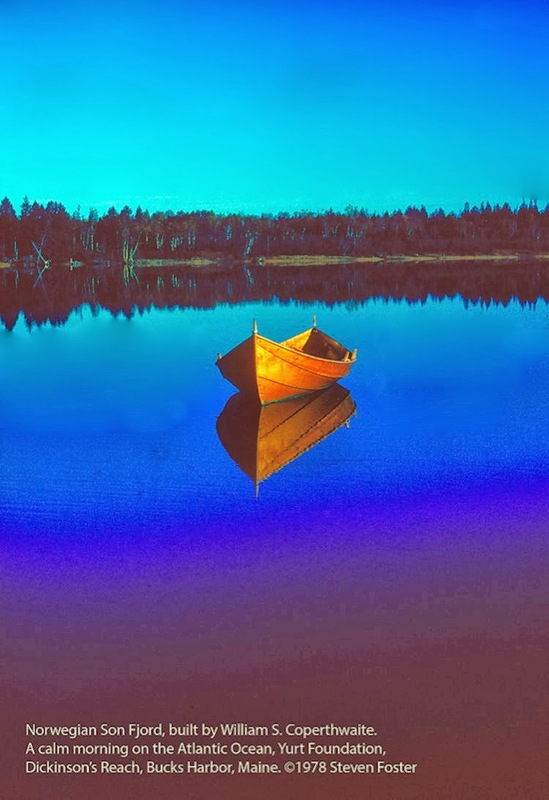 Lubber's title refers to a person that is out of sync with his environment, commonly known in the nautical expression, 'land-lubber', a person not acclimated to seafaring." As one who is always curious about how things are made, I got close and saw the marks left by the thousands of staples (all carefully removed) used to hold pieces together as the glue dried. In a nearby exhibit were a few shaker items from the local Shaker village. Can you guess which left the more meaningful impression? One was designed to get attention, and the other to serve. As is common in all my travels, I came home overstimulated with ideas about things I want to make. No huge wooden balls... OK? On another matter, it seems that the old saying "we are what we eat," may be closely related to the various microbes we use to digest our food. Researchers are learning that what we have in our guts has profound effect on our processes of thought, and our feelings about life. "Gut Bacteria Might Guide the Workings of our Minds." On our AEP/SWEPCO ordeal in which the power company wants to run a 345 kV power line through our beautiful hills, and whack away at our local beauty and tourist economy, the Administrative Law Judge has now decided she's heard enough argument to decide the case. Her ruling will be revealed to us in 90 days. That is a long time to keep our fingers crossed, but I have faith that we will prevail over the ugly power monster either in the Public Service Commission or in the Arkansas Court of Appeals. And AEP/SWEPCO should be ashamed of themselves for proposing such arrogant stupidity in the first place. 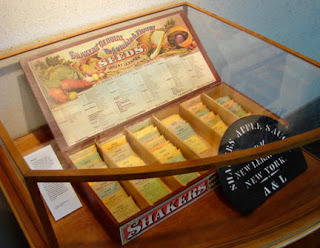 I received this Shaker box as a gift for my Fiske lecture on Thursday. Made by NWA craftsman Charlie Goddard, it is a box I will treasure. 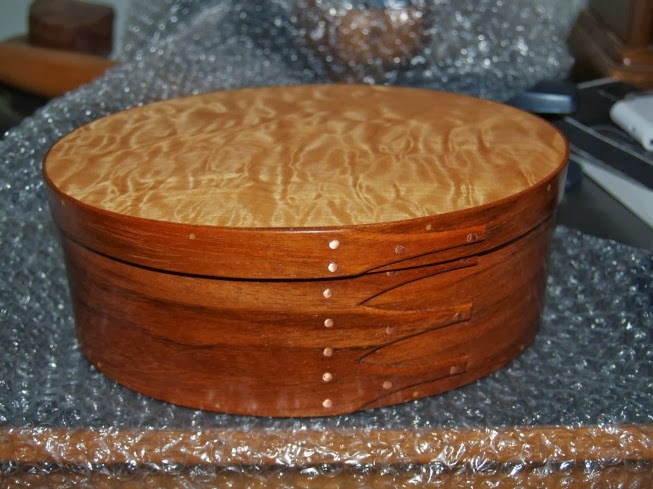 It is made of jatoba and quilted maple. It is so beautiful, I have to brag upon Charlie's craftsmanship and express my pleasure in owning it. Today in the Clear Spring School wood shop, my 4th grade students made a gerbil house compete with steps and deck. The gerbils love it, and we were all excited to see how much fun they are having in it. Doing difficult and complex things add more to the sense of self, than to do only those things which take little or no effort. As I flew home yesterday, a two year old in the seat ahead and to my right was busy on her mother's iPhone. It was amazing how adept she was at scrolling through folders to find the activity she sought. The technology is designed to make it as easy as possible for even the least among us, and if our aspiration is that all things be made that easy for us, our technological revolution is an amazing success. The phone kept her busy until the noise and change in air pressure led her to demand the comfort of her mother's arms. There is a difference between the digital world and the one that offers real satisfaction, growth, and the rewards of physical accomplishment. The photos are from the weekend class in Albany. Evidently, I was lucky on my timing of return. A friend on a later flight home from Albany was held at the airport by very serious weather in the Mid-West. Today in box making class, we used the flipping story stick technique to hinge a box, and to install a lift tab to the lid. Then we made a dedicated finger joint router set up, followed by making a finger jointed box and lift lid. As a final project, we made a jig for installing miter keys in separately made lids. It was a great day in every way. Definition, will: an intrinsic moral force that compels the individual in the direction of service, integration and growth. I will be home in Arkansas tomorrow. I am in Clifton Park for my two days of box making class. 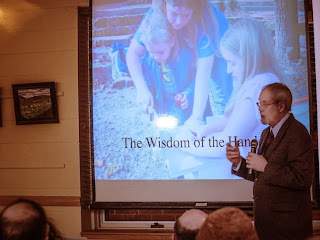 Last night the Fiske Lecture was attended by over 100 woodworkers and I was amazed at how attentive my audience was. I guess the important point was that I was saying things about the relationship between the hands and brain that they already knew. It is easy to pay attention when what's being said resonates with what you find through an examination of your own experience. And as we begin acting upon what we know to be true, we offer the possibility of a renewal in American education. This doesn't mean we won't face the usual arguments against change. In 1876 the Philadelphia Centennial Exposition introduced the "Russian System" of woodworking education. At the same world's fair, an exhibit from the nation of Sweden brought Sloyd models to American attention, and a small Kindergarten that folks were allowed to visit captured the hearts of millions of visitors and awakened for them the notion that learning could involve something other than heartless drill. Cutting lid panels to fit. 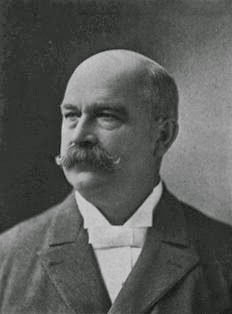 Calvin Woodward from Washington University and John Runkle from MIT, as a result of that fair were moved to become the founders of Industrial Arts Education in the US. It wasn't because there were students to be kept in schooling that weren't planning to attend college, but because all children needed what the hands could bring to learning. And yet, as in all things, folks have a tendency to become dumb and complaisant over time, and forget the original purpose of things. There is a rich history related to the use of the hands in education that I hope to share with others. Last night's audience as attentive and interested. They asked very important questions. It is a distinct honor to be here. Now, more box making! Cutting the lid from the body of the box. 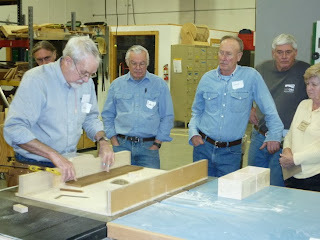 We met today in the new NWA Herman Finkbeiner Woodworking Center, with 15 students, and made boxes. Today we had a quick class about design, we made a sled and keyed miter sled, assembled a couple boxes, cut the lid from the base and are ready to apply hinges in the morning. Man is the wisest of all animals? I don't think this is so very hard to understand, because most people will be able to look back and interpret their own experiences and learn that what I say is true. So, how do we re-engineer American education to make room for how children actually learn? The answer is simple. Remove the pretense. Make things real. Give kids real things to do that offer greater challenge and resistance than that offered by fingers sliding over glass. Part of tonight's address will be about fingerspitzengefühl, a German term that describes the kind of intelligence that you get from doing real things. A quality woodworking program provides experiences far more important than those typically associated with woodshop. 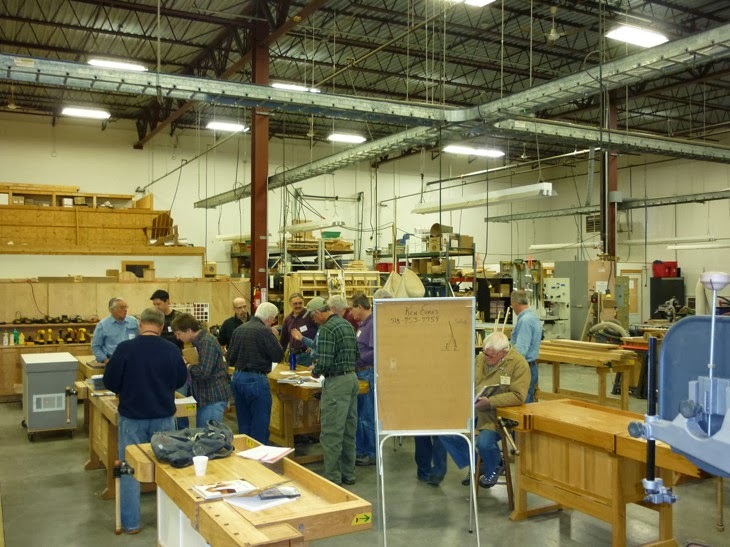 Courses, like woodworking, where students use their hands build confidence, strength of character, and problem solving capabilities useful in all careers and in every educational experience. Furthermore, working with a natural material in a creative manner assists students in connecting the relevance of other subject material to their daily lives. in engineering, architecture and science. evidence of their mastery of skills. self-assess the quality of their work. to feel the sense of beauty in form. woodworker but also as a student. of skills and pursuit of excellence. and actively in learning exercises. human development in historical context. Is a class that students enjoy! Just in case you would like to help your local schools see the light, this list might help. I had class with my lower elementary school students this morning, my middle school students this afternoon, and I am packing for New York. I was reminded to reprint this list by an article in Treehugger.com. Don't you just want to get your hands on stuff? Don't you just really want to engage in hands on learning? And yet we've devised schooling in which our most useful implements of exploration and learning are denied us. Today I'm preparing for my lecture and class in New York. In the meantime, there are more mass media findings this week following those of the American Academy of Pediatrics on the amount of screen time spent by kids. Despite a rating system on movies, gun violence in PG-13 movies has tripled since the rating system went into effect in 1984. In fact, researchers found more gun violence in PG-13 movies than in those with an R rating. Gun Violence in American Movies Is Rising, Study Finds. Should it surprise anyone that kids have fantasies of violence and that gun violence in schools has become a serious problem? What if we had movies in which we witnessed people making things for each other instead of destroying lives? On another subject, I ran across a video on box making in which the actor claims one of my designs as his own. I would have been OK with me for him to make a video of his interpretation of making my box design if he had at least been honest about it. He might have then personalized it in some way to engage in a dialog with other makers. I am curious how my readers feel about such things. I believe that if you want to use something that belongs to someone else, you ask first, or at least honor your source of inspiration. I have contacted the craftsman and notified him of my concerns. It seems an awkward situation, and I'll be curious to hear his response. 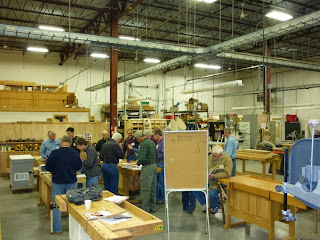 From the Newsletter of the Northeast Woodworkers Association, Clifton Park, NY. Doug Stowe has been selected as the 2013 recipient of the Fiske Award and will be honored at the November general meeting, November 14, 2013. He will be the 18th to receive the award. Among previous awardees are Silas Kopf, Phil Lowe, Teri Masaschi, Ernie Conover, Hank Gilpin and Garrett Hack. 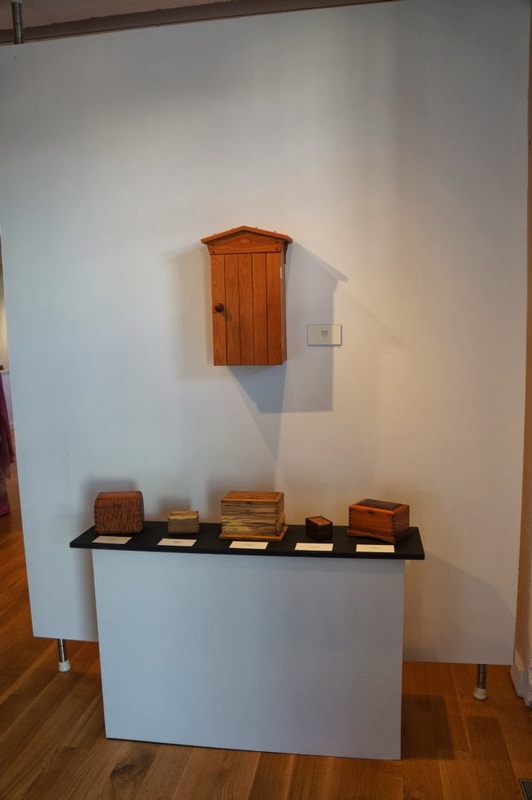 Doug has been a self-employed woodworker in Eureka Springs, Arkansas since 1976. He is an expert furniture designer but is probably best known for making boxes. 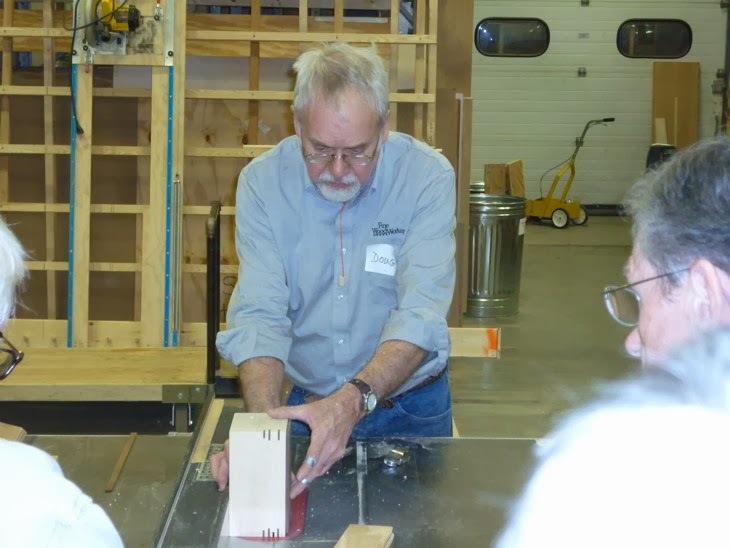 He is the author of seven books, including one entitled “Basic Box Making” which is an excellent reference for anyone who wants to make boxes. 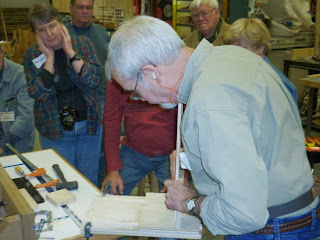 He has written many articles for Fine Woodworking and American Woodworker and Woodwork magazines. In addition to his work in his own workshop he teaches children at the Clear Springs School. When I asked him for some information to put into this article he sent me the following, which I have decided to leave just as he wrote it. “When I met Herman Finkbeiner at Showcase a few years back, I told him about my Wisdom of the Hands program at Clear Spring School, and he asked if I knew of the German term, Fingerspitzengefühl . I think it was Herman’s way of reminding me that wisdom is not exclusive to a particular culture or language. 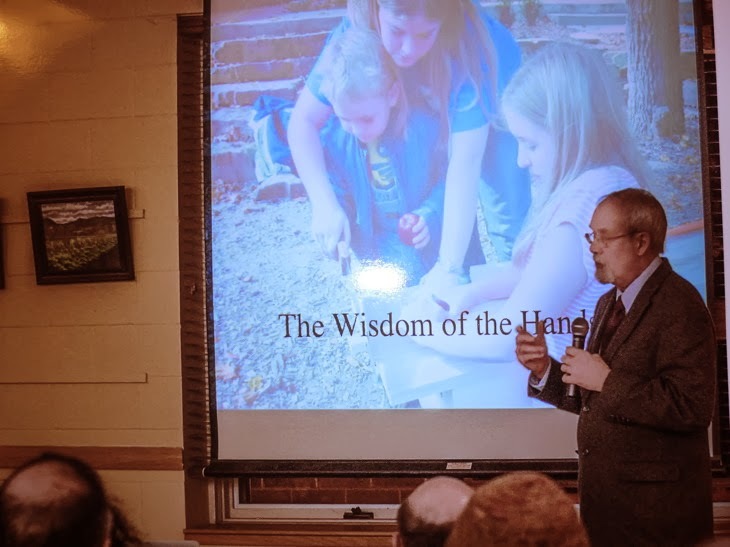 It means finger-tip knowledge, and is essentially the same thing as what I’ve come to call “the Wisdom of the Hands.” In honor of Herman Finkbeiner, I will be talking about how the hands make us smart. “ “It seems that with all the technology that surrounds us in every waking minute, we have a tendency to undervalue the creative act through which the hands and mind are fully and deeply engaged in making beautiful and useful things. Early teachers and administrators in many of our nation’s first public schools knew how the hands make us smart, but also that the hands have the power to shape the moral foundations of our culture. It seems that too many educators have forgotten this essential relationship between mind, heart and hand. 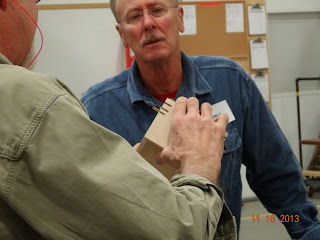 Woodworkers, on the other hand, will never forget that which we rediscover every time we enter our wood shops.” Doug will show some slides of his own work and some photos of the kids at Clear Spring School, and will talk about tools, hands and the development of intellect. 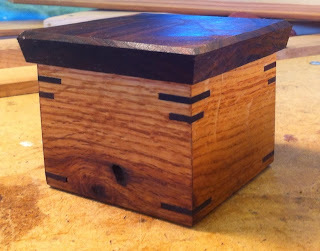 In addition to the Fiske Lecture on November 14, I'll offer two days of box making class. There may still be an opening or two. Contact NWA Education. I am trying to gather my thoughts for my sidebars on design. Let me know if this is helpful to you. There are two sides to 3D design. There are aesthetic concerns. How do we make this box beautiful and interesting? 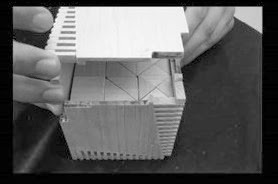 Then there's the practical or technical side having to do with how corners are to be joined, how various parts and components work in relation to each other and what tools and materials are to used to their best effect in creating a box. These concerns are not unrelated. 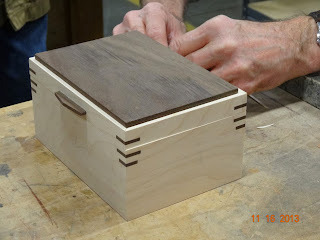 The techniques used in making a box, for joining corners and the like, will offer a sense of rhythm, or contrast or add to the texture to the box, with each of these increasing its visual interest and proclaiming your craftsmanship. The lasting beauty of the materials used in making a wooden box is a value that deserves attention. I tell my adult box making students that a good box can be a "toe turner." Artists attending their booths at craft shows have noted that they can pretty much mind their own business, reading, or quietly working or the like, keeping an occasional eye on traffic passing by until they see toes turning toward their work. This turning of toes is a physiological customer response and clear sign alerting the artist to look up from his or her work, make eye contact with a new admirer and begin the process of making a sale. We all want our boxes to be toe turners. We want them to attract interest from across the room and then sustain that interest as admirers draw close... as they visually examine remarkable qualities and feel the fine textures we've worked hard to impart. Aside from the technical expertise we hope our boxes will convey to their admirers we hope that they will also convey a sense of our own enjoyment of them as finished products and express the enjoyment we found in the process of making them. This, I believe, requires a sense of playfulness in their making. They say that human creativity significantly decreases for every year past Kindergarten. Schooling does some of that as we are taken away from self-directed play and expected to conform to measurements and standards imposed by others. That invites a sense of awkwardness in our sense of self. Returning to that sense of natural playful creativity is one of the most difficult things for adult box makers. It requires suspending judgment of our own work, and being willing to risk failure. Plan to make more than a single box at a time, so that you can try different things with each one. Just as a child goes down the slide and can hardly wait to climb up to the top again, convinced that the next trip will be even faster than the first, invest in a spirit of play in your work and take pleasure in the process, even if this requires you to take less concern for the finished box. In time, and through multiple trips down the slide, your boxes will turn toes and gain the attention your craftsmanship deserves. The images at left and below are of Froebel's 5th gift, as interpreted by an architecture grad student at the University of Miami, Ohio. The teacher, John Reynold's is an enthusiast for Froebel's work and his influence on architecture as manifest through the work of Frank Lloyd Wright. 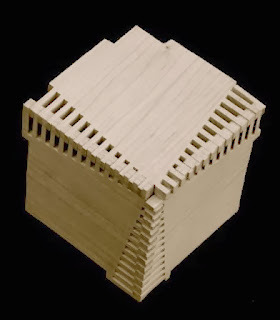 Froebel's 6th gift, and the one most influential in Wright's career as an architect, consisted of small blocks that when assembled and put away in its wooden box formed a wooden cube. In play, it could be used to create an infinite number of architectural forms. In the whole world of nature nothing develops without activity, consequently play or the exercising of the child's activity is the first means of development in the human mind, the means by which the child is to become acquainted with the outer world and his own powers of body and mind. Watching the play of children Froebel found it was a spontaneous God-given activity, by which they were surely but consciously educating themselves, getting their first knowledge of duty and the truths of life through play. The community spirit is fostered as the child finds he is only one of many, and that each one has his part to do to make the many happy and useful. It is also an aid to self-government, for through play he learns that certain effects follow certain causes, and in all that he does the child feels constant freedom under law and soon finds the closer he follows the law the more freedom he has. Thus the will of the child is guided and strengthened, and the principles of justice, honesty and kindness are inculcated. We have become so strongly focused on standardized testing and so adverse to recognizing schools as places in which moral development takes place that we seem to have forgotten this important role of schooling. I have written before about the moral implications of craftsmanship and shared with my readers that woodworking was understood by early manual arts educators as being a way to extend Froebel's kindergarten method into the upper grades. Moral behavior has its roots in empathy derived from seeing how closely interconnected we are with each other, and understanding that what we do has real effect either to hurt or to harm each other. 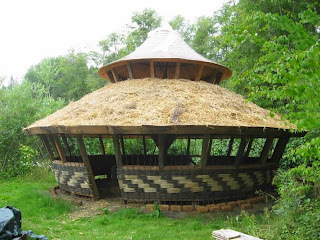 There is no better arena for this than a wood shop in which children or adults are brought together with the shared goal of creating useful beauty. And yet, most educators, after they'd removed most manual arts from schools, would be reluctant to admit that we might ever have actually learned anything from them. As stupid as this may seem, Toys-R-Us has a new television ad mocking outdoor education and telling kids that it is more fun to play with plastic toys than to spend time outdoors. If corporations could be embarrassed by their own stupidity, this would be one of those times. The ad presents one more good reason to limit children's exposure to TV. Help them to be makers instead of consumers of imported plastic junk. Help them to be actively engaged rather than passively entertained. Help them to find toys that lead to greater learning without disparaging the natural world that Froebel hoped to engage them in. 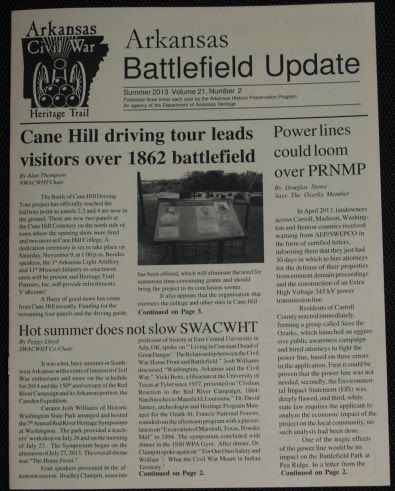 As you can see in the image at left, I have an article about the AEP/SWEPCO powerline debacle in the current issue of Arkansas Battlefield Update. It can be read here: Powerlines could loom over PRNMP. We're still planning to stop this ugly thing from damaging our community and our environment. The American Academy of Pediatrics has issued new guidelines for media time for kids. These guidelines will be a shock to most parents and will likely be ignored to the detriment of most children in the US. The average 8-year-old spends eight hours a day using various forms of media, and teenagers often surpass 11 hours of media consumption daily, according to the authors of the AAP statement. More than three quarters of teenagers have cell phones, and teens ages 13 to 17 send an average of 3,364 texts per month. Several studies have linked high media consumption with poor health outcomes. For example, children with TVs in their bedrooms are more likely to be obese. The new guidelines suggest no more than 2 hours of screen time for most kids, no television or computers in children's bedrooms, and no TV at all for children under two years old. Those stringent guidelines would be a major challenge for most parents to meet. Parents watch their kids manipulating small screens and think they've given them their best by providing the latest technological devices. But what their children actually need most is to be purposefully deprived of these devices and be given tools that offer tangible creativity. Television and technological help children adapt to boredom, emptiness and a life of doing nothing of significance. Shop time is far more instructive, and can lead to a more active life. It is certainly true that computers are powerful tools, but that's all that they are. Without the more practical tools to lead children into active lives, our children and our civilization will suffer tragic consequences. A sense of powerlessness will likely arise. In fact, you may be feeling that already. 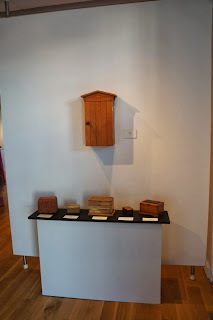 The other day, a freight company returned the objects from my show in Tulsa, and the driver complained that the world was full of folks who were content doing nothing and simply drawing benefits from social services like food stamps. But between media consumption that keeps children entertained and schooling that forces children to adapt to circumstances of bodily stillness and intellectual complaisance, we've left then ill prepared for productive life. What else could we reasonably expect? Norm Brosterman's excellent book, Inventing Kindergarten is the subject of a kickstarter campaign to bring it back in print. I hope my readers will support this worthwhile project. It is 12 days from the deadline and is well on its way to making it. A friend of mine had gone to Fayetteville, Arkansas for a CT scan of his abdominal region. He had pains that the doctor wanted to investigate. He had been through the procedure and was on his way home with his wife, when she got an emergency call from the doctor asking that they turn around immediately and head back to the hospital. The doctor was, as he explained it, convinced that my friend had a malignant tumor. Bob was prepped for surgery, and Cindy was terrified by the doctor's suspicions. What the doctor found, however, was not a tumor, but an inflamed appendix. Cindy was relieved. Bob recovered. It seems that this kind of misdiagnosis is actually quite common because doctors are no longer routinely taught to use and trust the sensitivity of their own hands. This article from Tufts explains it. Why CT Scans are Bad, All Will Be Revealed. It seems that doctors of old were taught simple methods of diagnosing appendicitis, by poking and prodding the patient's underbelly. You probably experienced this yourself in your youth. As doctors have become more reliant on technology and less on their own learned sensitivities, mistakes due the unnecessary application of high technologies have become commonplace. The computer is also having a detrimental impact on design, as Traditional skills are being lost by designers relying on computers. A reader asked if I would explain some of the qualities of character that are being lost as we've become a culture in which making things for ourselves is no longer the norm. As described above, sensitivity in the manipulation of hands, tools and materials is certainly a matter of concern when it comes to training the doctors and nurses who work on our own bodies, and in the field of design where appropriate use of materials has impact on the usefulness and longevity of the objects that we take into our lives and upon which (in some cases) our lives may depend. "Persons not manually trained, generally regard the products of manual labor at less than their real value. They think it much more difficult to solve a mathematical problem than to make a table. It is not an easy thing to make a parcel-pin or a pen-holder with accuracy, and when students have done these things they will be the better able to estimate comparatively the difficulty of making a table or chair; and what perhaps is of still greater importance, they will become qualified to decide between what is good and what is bad work, and thus avoid the misfortunes which befall the ignorant and credulous through the impositions of knaves." This matter is even worse now than what Salomon describes. So many from all sectors of society have so little sense of what it takes to create, and have not learned that craftsmanship is the foundation of human culture. As our economy fades relative to that of other nations, those who have power and those who do not have little to do but stand idly by with twiddling thumbs. I've made it through my first reading of Peter Korn's new book, Why We Make Things and Why it Matters, the Education of a Craftsman. The book is much more about his life than about the reasons that we make things, and so if someone is not particularly interested in his career as a craftsman and the course of events that led to the founding of the Center for Furniture Craftsmanship it could be less of an engaging read than one might want. I am convinced that language is unlikely to convey the necessary motivation for one to turn the personal tide of one's life from idle consumer to maker of useful beauty. 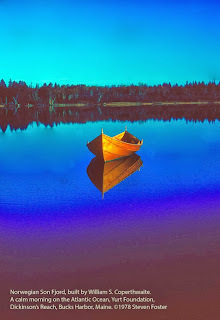 It takes having had some experience at some point in one's own life to plant the seed of hunger for future creativity. It takes work, after all. It takes long hours, practice and sacrifice, just as Peter Korn describes eloquently in this book. I had some unreasonable expectations of Korn's book. He is a person I greatly admire. We've talked for years about the books we were writing, and I congratulate Peter on actually getting his done. On the other hand, I was hoping that he would do some of the heavy lifting for me. I would have made the title more insistent.... Why we must make things, for example... our humanity is actually at stake. There are moral consequences to our failure to understand the world through the looking glass that the hands provide. Idle ones are the devil's own. While Korn describes the journey of the craftsman as a journey of transformation, he fails to build a case for its universal imperative. Today, I applied Danish oil to more boxes. Tomorrow I will spend mostly at the computer, editing chapters of the new box making book. 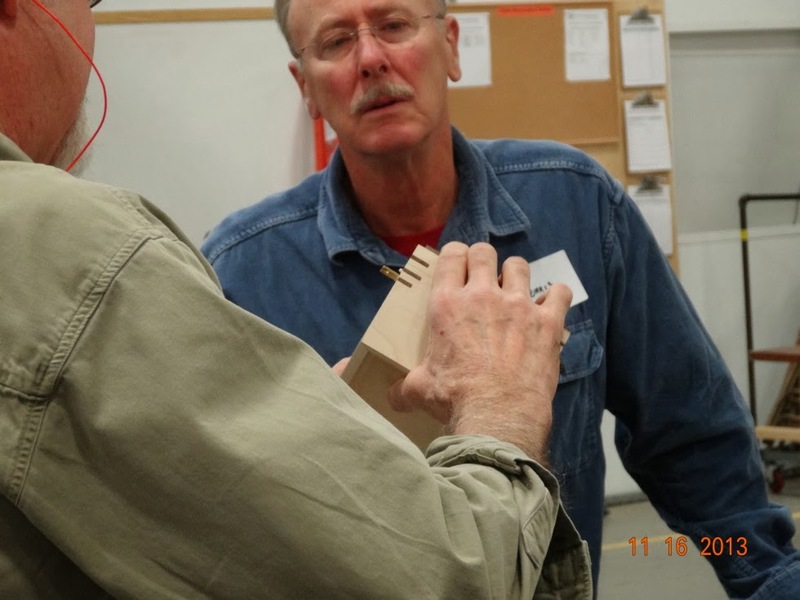 I have learned that there are still vacancies in my box making work shops in Clifton Park, New York Friday and Saturday, November 15-16, 2013. If you are interested, please contact Tom Moran. There is a very good reason for beginning woodworkers to start out with the simplicity of hand tools. I've discussed this before. If you have two points, a straight line is formed. You can see this principle at work using a line tool on a drafting program, or by making two dots on a piece of paper and then using a pencil and ruler to connect the dots. But what direction is formed by those two points? If you know the order in which the points are laid, you can see that a vector is formed and a sense of direction is implied. So what in the heck does math have to do with woodworking and the hands? ...EVERYTHING. 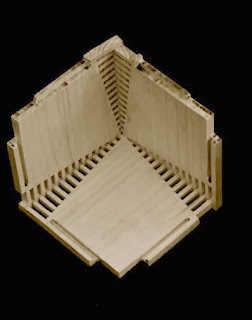 One thing that I notice when corresponding with woodworkers who have some question about a book or article is that those who seem to have been fully immersed in power tools tend to first seek solutions to their difficulties by imagining complex power tool techniques. They have a tendency to overlook the most direct, simple and elegant solutions. They may be inclined to assume that some complex jig may be required to perform an operation when simply tracing around a part with a pen or pencil will suffice. A friend calls this "parsimony". And in his logic, being parsimonious is a good thing. But parsimony comes from having a broad range of experience, including hand tools, to offer simple rather than complex solutions. They say, "Keep it simple, stupid," and there is no better way of keeping things simple than through the use of direct action on wood, using hand tools. They also impart a greater understanding of the qualities inherent in the material, in this case, wood. If your first thought when faced by a problem is to build some complicated device to fix it, you may be overlooking your most readily available resources.... your own hands... and you may over complicate matters to the point that you are stopped in your own tracks. 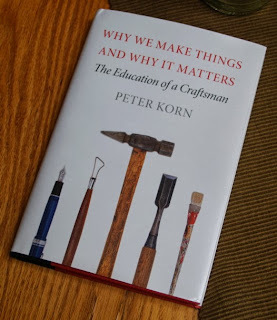 I have begun reading Peter Korn's new book Why We Make Things, and Why It Matters... the Education of a Craftsman. 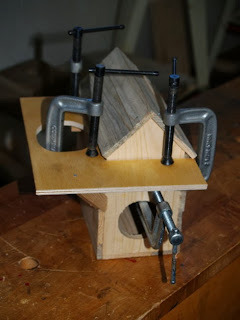 My intention is to do a review for British Woodworking Magazine, but also to share a bit of it in this blog. "I just discovered you, by accident, and wanted to thank you for your wonderfully written articles on slöjd. I am very curious where you have "taken" slöjd to in your own pedagogical development. My own "education" in slöjd is bounded by what I have read by Salomon, Larsson, and Barter -- mostly pre 1900 that is." My main interest in Sloyd has been that it embodied a way of thinking about learning, and the necessity of personal creativity that has been forgotten in American education, but that came to life for me through my life as a woodworker. Educational Sloyd, as it was practiced in Sweden in the 19th century and as it was imported to the US was perceived as rigid in its form. Many practitioners were concerned with rigid adherence to the system of models and exercises. Salomon, on the other hand, recognized the necessity of evolution and adaptation when he described Educational Sloyd as a "casting mold" from which new forms would emerge. Carl Malmsten, when he was at Nääs, turned the place upside down in turmoil when he insisted that they had lost the creative edge that was required to engage kids. And that is what happens all the time. People look to what others have done and attempt to rigidly adhere to a script that they think will give them the desired result. The same problem is found in all top-down curriculum schemes that attempt to ignore the interests of the child and superimpose the judgement of committees and boards over the teacher's relationship to his or her pupils. The teacher's first responsibility is to adapt to the needs and interests of the child. So it would be a disservice to kids to keep things as they were in the 19th century, and it would be a disservice to my readers for me to come up with a curriculum that would be laid in place of the teacher's responsibility to listen to and be engaged with the interests and needs of his or her own pupils. "Traveling through the country," says Elizabeth Harrison, 'Froebel listened to the cradle songs and stories which the German housewives told to their children. He noticed how the little children are constantly in motion, how they delight in movement, how they use their senses, how quickly the observe and how they invent and contrive. And he said to himself, "I can convert the children's activities, energies, amusements, occupations, all that goes by the name of play, instrumental for my purpose, and transfer play into work. This work will be education in the true sense of the term. The conception I have gained from the children themselves; they have taught me how I am to teach them.'" In wondering where Sloyd should go in the future, it is important to remember its roots in the Kindergarten method. Uno Cygnaeus and Salomon and all the early proponents of Educational Sloyd, saw it as the best means to carry the Kindergarten methods into the upper grades. Learning was to be fun, driven by the interests of the child, and yet educators seem insistent on making education a dismal experience that must be endured... just as for so many folks, work is a dismal thing. As a woodworker, I have seldom found it to be so. On a slightly different subject, I find that I keep learning simple new things each day. For example, two days ago when I was putting away the brush I had been using to apply Danish oil to finished boxes, I put it in a jar with linseed oil. 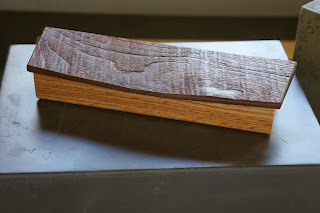 Boiled linseed oil is one of the ingredients of the Danish oil formula I use, so I reasoned that the brush could be safely stored in it without drying, and without contaminating the Danish oil when I returned to its use applying the next coat. This morning when I returned to oiling, the brush was in perfect condition and ready to go. A few days beforeI learned that when I was left with too much glue on my fingers after having spread glue in recesses for inlay to fit, I could wipe the glue on the underside of the inlay instead of on my pants. It only took me 38 years to discover that simple trick. Very simple observations like these form the creative edge. By watching ourselves and others we discover new things. "Their highest joy was to give their parents and me fruits from their garden. Oh, how their eyes glistened when they could do it. Beautiful plants and little shrubs from the field, the great garden of God, were planted and cared for in the little gardens of the children"
"This weekend I finally took the plunge and followed your book as closely as I could, and the box turned out great! When I gave it to my wife, she was speechless!" I learned a lot making it, and I'm looking forward to my next one!" There is no difference between the feelings that adults get in making something of useful beauty, and the feelings of children upon having made or grown something of tangible value to adults. The following is from the Paradise of Childhood, as it tells the story of Friedrich Froebel's life and gives insight to the origins of his method. "In those days which Froebel spent with his pupils in the little country house that had been fitted up for them he sought always to combine labor with instruction and when the boys were busy with hatchet and spade, with oar or fishing tackle, he made every occupation serviceable to awaken their desire for knowledge. And we are told that the regular and moderate method of living which they followed banished all the indolence and helpless dependence of the children, so that in a short time they improved wonderfully in health and strength and the keenness with which they enjoyed life was greatly increased. "When, however, autumn approached, with its dark days, long evenings and bad weather, considerable time was given to the practice of music and drawing. But here were still unoccupied hours which in summer had been devoted to rural occupations. How could they be spent pleasantly and profitably? Referring to his experience at this time Froebel says: 'When my pupils came to me with some new demand I asked myself, 'What did you do when a a boy? What happened to you to quicken your impulse for activity and representation? By what means was this impulse at that age most fitly satisfied? Then out of my earliest boyhood something came to me which gave to me at that moment all that I needed. It was the simple art of imprinting, on smooth paper signs and forms by regular lines.' He also remembered how he had tried to keep himself busy with all kinds of braided work from paper and binding twine, and he resolved to try this occupation with the boys. "In carrying out this plan he was brought at once to a realizing sense of the crudeness with which the unpracticed hand does its work, how poorly the will is master of the finger-ends under such circumstances, and how inaccurately the eye observes. Consequently he deigned a few preparatory exercises for training the hand and eye, so that the boys could undertake their pasteboard work. Be began with folding and the separating and pasting of papers. He also let them work with twine, till they became experts in making nets and game bags. In these occupation they had to bring into practice what they learned in drawing, arithmetic, and geometry. Later in the season, they did some woodwork." Have you ever thought of making your own nets or wondered how fishermen and games keepers were able to do so? The video at below shows one of the things the boys in Froebel's care did for their own amusement and intellectual development. The following video shows how to make the tools you will need for net making. An additional video shows an even simpler method. Students need to find ways to cope under difficult circumstances. But schools should offer these opportunities in the first place. In this video you will find a young man who was driven by a compulsion to escape the pressures of the Korean school system, and learned from his outside the classroom activity to be a philosopher. It's just what Jean Jacques Rousseau said would happen. "Put a young man in a workshop, his hands will work to the benefit of his brain and he will become a philosopher while thinking himself only a craftsman." Larry, Thanks for the link. 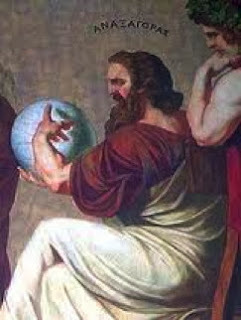 "Self activity of mind is the first law of the institution; therefore the kind of instruction given there does not make the young mind a strong box into which as early as possible all kinds of coin of the most different values and coinage, such as are now current in the world, are stuffed; but slowly, continuously gradually and always inwardly, that is according to a connection founded upon the nature of the human mind, the instruction steadily goes on, without any tricks, from the simple to the complex, from the concrete to the abstract, so well-adapted to the child and his needs that he goes as readily to his learning as to his play." This is what we expect our visiting team to discover at the Clear Spring School.